Park West, 322 W Armitage Ave. 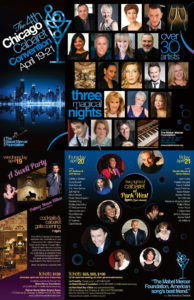 I am honored and excited to be a part of the Mabel Mercer Chicago Cabaret Convention this year. I will be performing on July 20th at the Park West. Your hosts for the evening are KT Sullivan and Jeff Harnar. On Wednesday May 19th, "A Swell Party" kicks off the Convention with a gala evening of cocktails, hors d'houvers and entertainment in the fabulous Empire Room at the Palmer House. View the full Chicago Cabaret Convention brochure here. 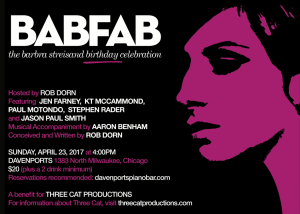 Come celebrate Barbara Streisand's Birthday and legacy with me and Three Cat Productions at their annual BabFab benefit concert event. Always a good time! 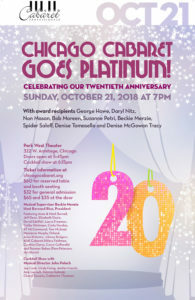 Please come and join me and a really star studded cast as we celebrate 20 years of Chicago Cabaret Professionals, at the beautiful Park West. 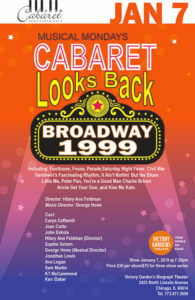 Along with the opening cocktail show there will be two acts showcasing your cabaret favorites and our past honorees. It will be a Glamorous and Glorious night of Song, Stories and Honoring Musical Memories. 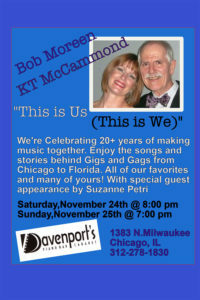 Davenport’s Piano Bar is celebrating their 20th year and so are we! For Thanksgiving, Bob Moreen and I take a peek inside our musical journey together. We’ve chosen some of our favorites, some of yours and the skinny on what’s gone into the making of some defining moments. Add to that the Dish, Suzanne Petri is joining us for some madcap fun! We invite you to Come, Celebrate and Enjoy the many gifts of Friendship with us. 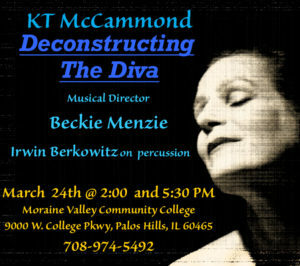 Join me and the Incomparable Beckie Menzie at the keyboards and Irwin Berkowitz on percussion, for a luscious taste of Divadom. A rollicking journey thru the musical signatures and colorful careers of Female Icons from Eartha Kitt and Marilyn Monroe to Tina Turner, Amy Winehouse and more. What’s it all about? It’s about Attitude, Darlin’ !